Looking furry! Interpret that as you wish. "This costume is a little too...UM... Ah! My underwear!" *nosebleed* love the black pantsu. To what is said, wat. To the cuteness, YAY! 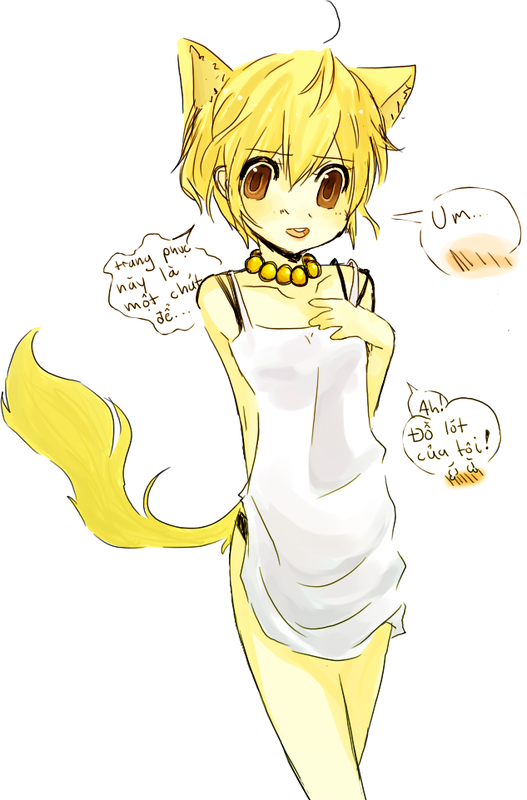 She'd need to lose the animal ears and tail though, that's not how I roll. Why does human daisy only have one tooth? Hair is mega cute omg. Mouth area looks kinda weird. Those black lines for w/e look like an awkward nose or mustache, and the mouth just looks unnormal. Other than that, it's adorable. It's not that I'm trying to insult it, it's just not normal for me to see that too often. Sorry if that came across the wrong way possibly, but your style is really adorable. Sorry :s.
:U Wow people are being sexual about this. I'm commenting on the cuteness......because thats how I roll. Kinda looks like her eye is trying to escape from her face. So cute, vietnamese like me too!